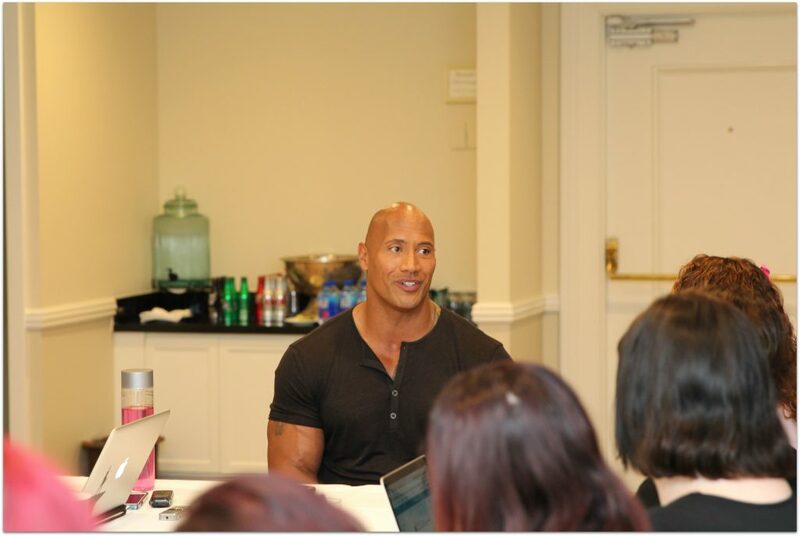 When I found out I would be interviewing The Rock, Dwayne Johnson, I may have squealed a little. I hope you’ve been enjoying the exclusive look into the Moana red carpet event and my thoughts on the movie. I saw it again for the third time last night at Disney World, this time with my daughter, and loved it even more than the first two times! I fell in love with Maui all over again! This interview was so much fun, only a video would do it justice! Sorry I couldn’t provide that during the main interview, but it’s not allowed. 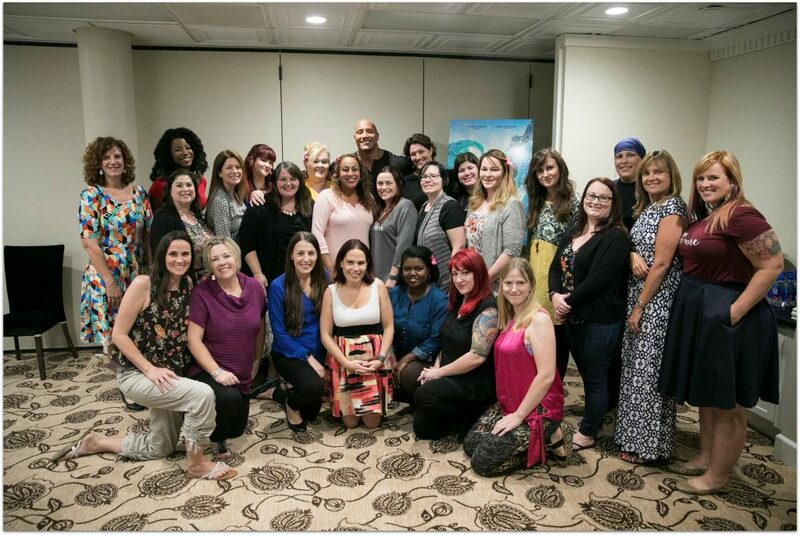 However, I did attend the larger press conference and got a couple of minutes of The Rock talking about what Moana means to him. The larger press conference is with hundreds of people, so it’s not as easy to get photos. I was a few rows back and people were raising their hands and taking videos and photos, so getting a good shot was difficult. This is where many of the TV stations and magazines ask their questions. Just a little before this press conference, I was excited to be in a room with 24 other bloggers, for an up-close, inside look at The Rock. In this intimate setting, it would be too distracting for 25 of us to be taking photos while asking questions, so a huge thank you to Louise from Momstart for taking these fantastic photos! The first question we had for Dwayne was “Why?” Why was it important for him to take this role? I remember him talking about this at D23 when Moana was first announced. Though he joked that it was money (he is the highest paid actor in the world right now) I knew it was more than that. 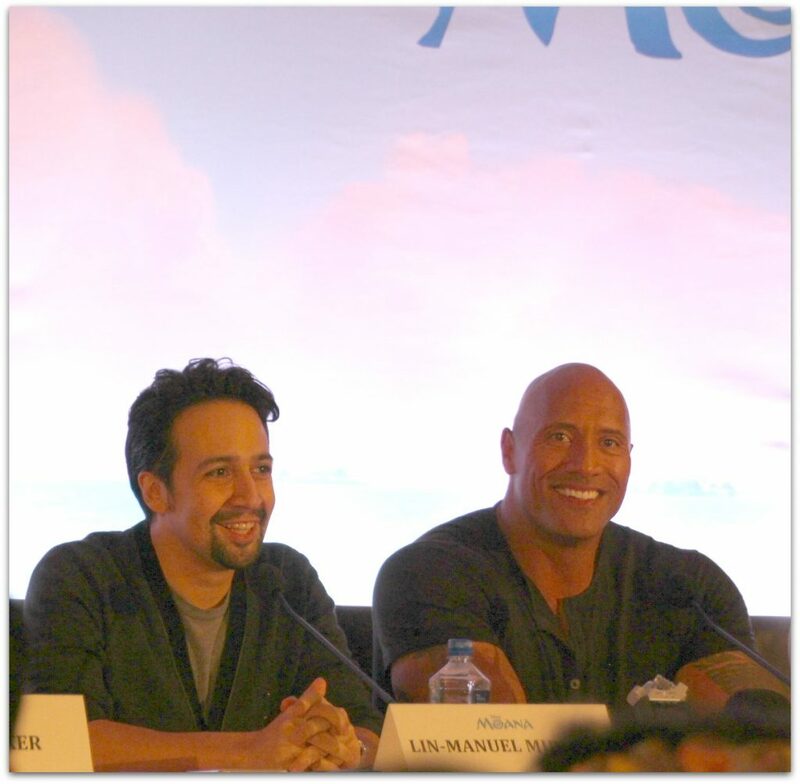 Dwayne: It was important for me to do the role because it was a great opportunity to showcase our Polynesian culture to the world. I’m half Samoan and half black. I felt I wasn’t too sure that I was ever going to get the opportunity again to showcase it. Our culture’s very rich and we’re very proud of it. It was also an opportunity to work with Disney in a classic animated capacity with the element of music. I’ve done two Disney movies in the past, live action movies, but this is a different machine. It’s still the same umbrella, but it’s a different machine, and it was, again, the opportunity to hopefully make a movie that was not only good, but you have a real good shot at creating something that was like a classic. And that’s what I wanted to do. We asked what the biggest challenge for him in the making of Moana. I hate to give you a spoiler, but this was such a fun part of the movie, and of the interview. And you’ll see the movie in 3 days, right?! We had to ask about the rapping. Dwayne: Yes. Let me talk a little bit about that! Of course. So I used the word opportunity before; it was a great opportunity to push myself, and to sing. The bar is set very high in a Disney movie when there’s the element of music, with really amazing collaborators musically; masterful musical people like Lin-Manuel, Opetaia, and Mark Mancina. They are very, very special. I felt confident going in because I felt I could prepare and do the things that I can control. So I was excited to sing a song, and to Lin’s credit, he did a lot of deep research. I’ve sung in the past, but [for] fun, I would go on a talk show, Ellen, or something, and I would break out a guitar and sing, and just make it kind of fun and silly. But he did his research and he found a comfortable range that I could sing in, and then he also pushed me a little bit. I had a real, real, real good time. And rapping too, and so… I’m a rapper! We asked what Dwayne wanted people to take away from Moana. Dwayne: I think there are a few messages people can take away from the movie. I also think that’s a wonderful thing about entertainment, and movies, and books that we read- we all have different interpretations of it. I think the cultural aspect is something that is very cool. And I also think they did a tremendous job of representing our culture in a way that makes us proud. There was a little bit of hesitation from all of us, by the way, but it was quickly quelled when I sat with John Lasseter and our filmmakers and they had taken me through their process. By the time the script got to me, they’d already done years of research in going to all the different islands, and speaking with the high chiefs, and the villages – trying to understand the cultures, which comes out in the authenticity of the writing. There’s a fierceness to our culture, as well, and a tremendous pride. So the takeaway would be showcasing the wonderful quality of our culture. Also, I think there’s a great takeaway that speaks to all cultures, and ages, and religions; We have this little voice inside of us, and to always make sure that we follow that voice, and listen to the voice – a gut intuition – and have that kind of faith, not necessarily religious faith, but faith that there is more. And you can be more. Kind of relevant today, right? In the film, Maui’s tattoos represent things he has accomplished. We asked what accomplishment in Dwayne’s life would he say was tattoo worthy, and he said it was being a father. Doesn’t that make you love him even more? This guy loves being a dad, so much so that he dresses up like Pikachu for his little girl. We wondered, does Maui perform at home, too? 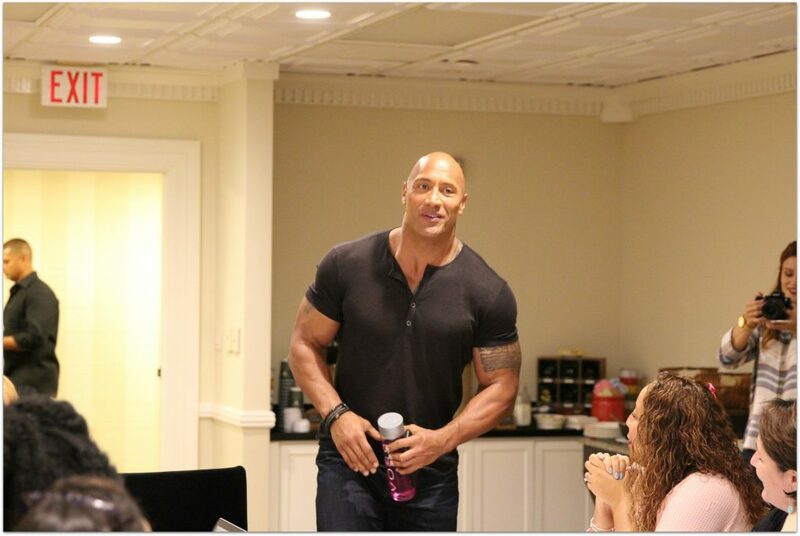 Dwayne: So interesting – we have Maui action figures and they’re kind of big, but we have separated Maui at home. So Maui kind of sounds like Daddy. But Maui is just Maui. I just didn’t want to confuse her, because when she watches the videos it’s all about Maui. But Pikachu, however…So, for those of you who don’t know, I dressed up as Pikachu for my daughter Jasmine. She’s eleven months old. We were in Hawaii shooting. She went to a pumpkin patch three weeks ago and she saw someone dressed up as Pikachu and she freaked out. She loved it. So Lauren and I thought, ‘What if Pikachu came for Halloween?’ So I became Pikachu. The challenge was finding a Pikachu costume that was big enough. We did find one, and it was so hot in that thing! So since then, Pikachu makes weekly visits. It’s a whole thing, right? Like, you guys know…Pikachu goes to get dressed in another room and he has to walk out back and around the house; he has to ring the doorbell, and then he has his fun with Jasmine, and it’s very funny. So, usually, Lauren is there, my mom is there, and they mess with me ‘cause I can’t talk, so Pikachu just doesn’t speak for obvious reasons and it’s so hot. And after fifteen minutes, you know I can’t say anything, so I’m getting ready to say goodbye, and Lauren goes, “Oh, uh, Pikachu wants to dance? He wants to dance?” And she puts on music and… another twenty minutes. But it’s the best. When you see Maui, you will instantly know they infused some of Dwayne into this character. The eyebrows will probably be the first thing you notice, but we wondered what else was taken from Dwayne to be part of Maui. 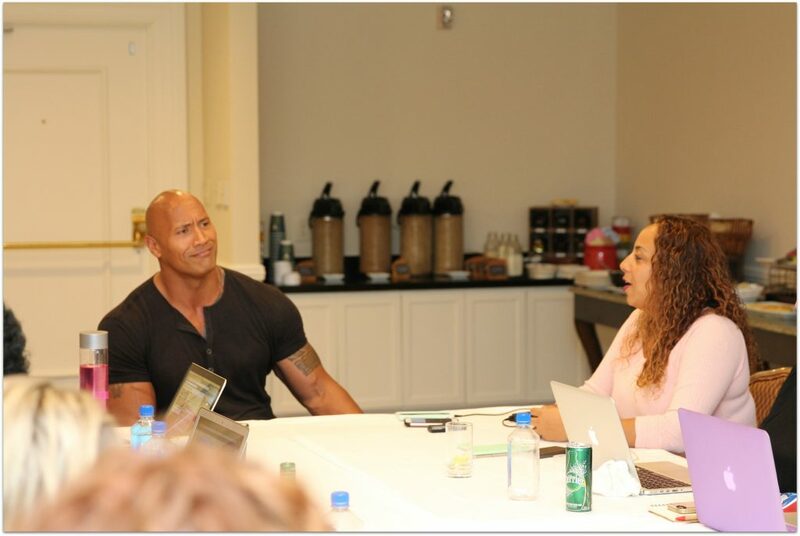 Dwayne: Yeah, there was a good amount that was infused in Maui. I think that there’s a part of Maui that I can appreciate, because it’s my DNA; I share that with him. There’s a fun side to Maui, and a desire to keep things fun, and keep them a little bit on the lighter side, and not quick to show vulnerability, and not quick to go down that route. And some bravado, a lot of bravado, because you can mask a lot with bravado. We asked how the process worked. Did they just animate him, have to put on the costume for them to get the facial expressions and body movements? Dwayne: Yeah, so it’s a really cool process for those of you who don’t know. There are multiple cameras in the room as you’re sitting in the studio and you’re going through these lines, and your facial expressions will then inform the animators on the facial expressions of Maui. So, if I say, ‘You can’t do that!’, my eyebrows go up, then that will inform the animators. So there’s all these really amazing unique little things that they capture that informs the animators. That would be a fun process to watch, wouldn’t it? Dwayne had many other interviews to do that day, but he was kind enough to take a quick photo with our group. Coming soon will be interviews with more of the cast, including Lin-Manuel Miranda! Subscribe here so you don’t miss anything! Check out my Moana World Premiere experience with Dwayne Johnson, Lin-Manuel Miranda, John Lasseter, and more from Moana, as well as my thoughts on the film. And please don’t miss Moana in theaters this week on November 23, the day before Thanksgiving! Gather the family and go see it together. It is for everyone, and I promise you will love it! See the trailer below! Visit the official MOANA website! Disclaimer: Disney invited me to attend this all-expense paid trip to attend the Moana World Premiere and other events surrounding the movie. Check out our itinerary to see what else is in store!